Late at night when the light is dim and I can no longer make out the microscopic eye of the needle on the sewing machine, I like to slip on my drugstore reading glasses, settle into the slipcover-challenged sofa and surf. 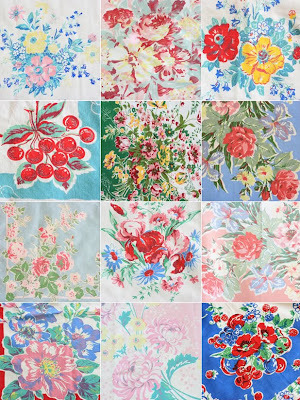 I was looking around a blog I'd never seen before, just glancing at photos, not really reading, when I saw this great collection of vintage tablecloths. Bell & whistles started going off. In my head, I mean. I started reading and saw my etsy shop mentioned in the post with the tablecloths. Weird, right? I know! Of course then I had to read the whole darn blog and of course, I loved it! 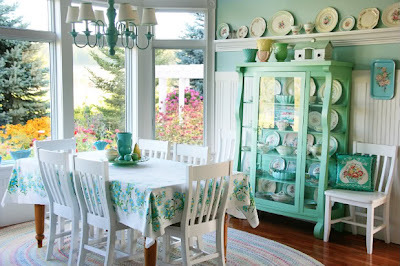 I especially love this vintage dining room, right down to the painted china hutch. The blog is Meadowbrook Farm. I'll leave the rest of it's vintage goodness for you to discover. Hope you love it as much as I do. Thanks Teresa, for sharing your beautiful photos. I have one of those tableclothes! It is a repro, but AWESOME! I am off to check out her blog! I will head over and take a look as these images are beautiful. I love it when I find a new blog that inspires me (and how cool to be mentioned). Love that dining room and off to check off that blog! I call that a 'God Wink'....you think it was just chance that you were rambling around cyberspace reading random blogs and stumbled onto a reference to your Etsy shop but it was really God telling you 'Hello - wake up and get on over there - you need to read this!'. I wandered over to Meadowbrook Farm and love her blog too. Isn't blogland a small world? Going to check out Meadowbrook Farm right now! How pretty and cheerful! I'll go over and have a look myself. Wow, I love that dining room...and the tablecloth love! Oh gosh your blog is beautiful. I'm so glad you left me a comment so I could find your blog. Her blog is beautiful, and the dining room really is too much for me to bear. I'm pretty sure that's supposed to be mine. Isn't her blog wonderful? I never get tired of looking at her home! I just love the whole blog!!!! Your box will go out Thursday! Talk soon! Thanks for the tip on Meadowbrook. It is a lovely blog, as is yours. Hi Amy! I am so delighted to have found your blog!!!!! I have been a somewhat distant follower of your work after finding your work on Ebay a long time/few years ago. I thank you for introducing me to the beauty of Wilendur and I covet your beautiful cushions! Tippy, tippy, TIPPY Toeing right over ... TY for sharing. that is so funny. i just stumbled on your blog like you did on that one. small blog world out there!! your blog is so wonderful. i can't wait to dig thru older posts and get totally inspired. very fun. you have tons of talent!!! How lovely that she did a post about your work! I had to hop over to read it and leave her a comment. Thank you for the lovely link and keep up the AMAZING work that you do! Happy Birthday! A lady who is in love with a certain dish towel sent me this way. Have a terrific day!! Just came over from Laurie's to wish you a Happy Birthday! The dishtowel you made for her is just DARLING! Happy Birthday - hope your day is wonderful. I love the towel you made for Laurie. Love your darling blog too! Happy Birthday.....Laurie sent me here, and when I'm done exploring your lovely blog I'm going to take your tip to visit Meadowbrook Farm. I think I'm going to have a busy night!